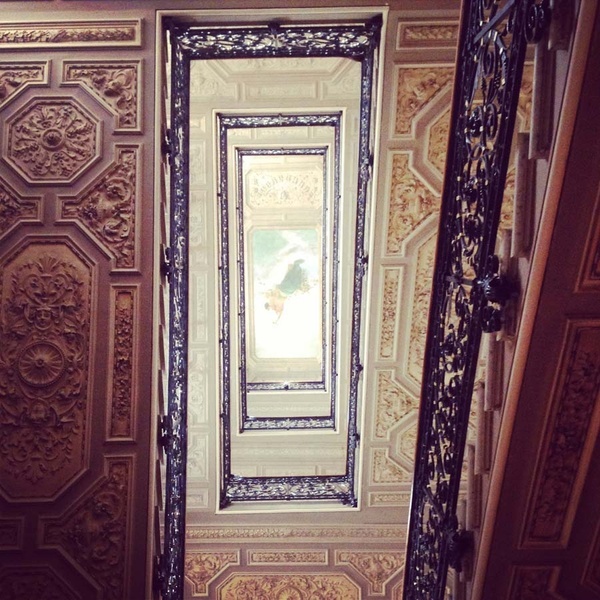 The grand stairwell at the St. Regis Rome. Photo by Pavia Rosati. This post was produced in partnership with American Express, part of Pavia Rosati's role as a Platinum for a Year Ambassador. 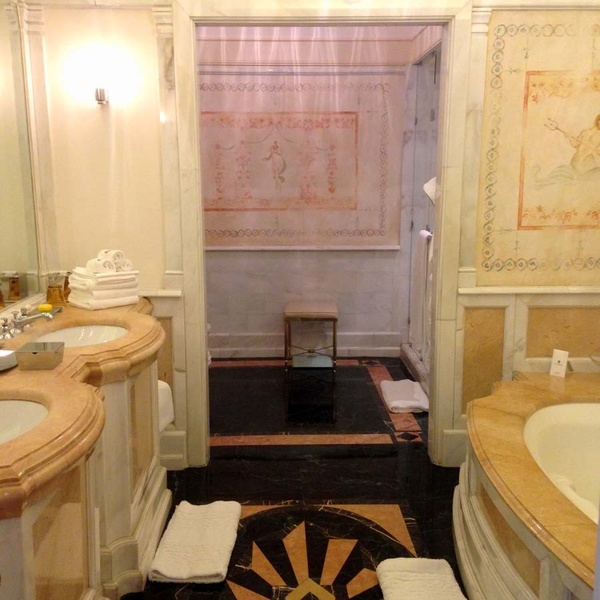 ROME – "And this," says Mario, opening the door with an understated flourish, "is the Designer Suite." He steps aside so I can enter and inspect the surroundings. I'm debating, you see, which hotel room upgrade I, as an American Express Platinum cardholder, would prefer. The suite he had just shown me, all buttery contemporary Italian décor, was gracious and lovely, and this one had to top that. I am at the storied in Rome, a town that has more than a little experience pitting competitors against each other in an arena. Well then. Let the games begin. I start in the foyer, where I notice touches both grand — a modern art canvas — and subtle — a silver tray filled with meticulously arranged artisanal chocolates. The sumptuous living room has an antique wood-carved desk, a long velvet sofa, a giant flat-screen television, and sculptural Bang and Olufson speakers. In the bedroom, books are stacked on floor-to-ceiling shelves and some 400 pillows in starched white linen fill the bed. The bathroom is a sea of marble and piles of thick white towels, Acqua di Parma toiletries standing like yellow ballet dancers ready to perform a pas de beaute. The cherry wood-paneled closet is easily the size of the train car I had just taken to Rome from Naples. French doors from the living room, foyer, and bedroom open onto one ridiculously long balcony overlooking Via Vittorio Orlando and Piazza della Reppublica below. "Grazie," I tell Mario. "It will do." The Designer Suite bedroom. 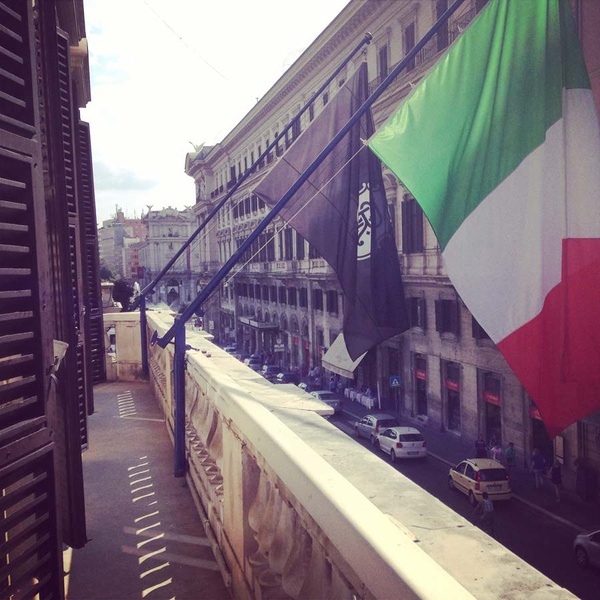 Photo courtesy of the St. Regis Rome. Details from the lobby, the bathroom, and the balcony of the Designer Suite. Photos by Pavia Rosati. So this is what it means to be Platinum. I'm a newly minted cardholder, a somewhat skeptical convert who had been convinced that her other card (which shall remain nameless) was the best possible credit card for travelers. But American Express invited me to put that my skepticism to the test and become a Platinum for a Year Ambassador. My challenge would be to try the card for a year and recount my experiences using the card — for travel, of course, and also for invitation-only events, entertainment, and more. I like a good challenge, and I liked the first test even more: picking a hotel in Rome from Amex's portfolio of . FHR is a selection of Platinum-worthy hotels around the world, and staying at one is a key cardholder benefit which includes all kinds of perks, like the aforementioned room upgrade and hotel credits to use on meals, spa treatments, and other amenities. 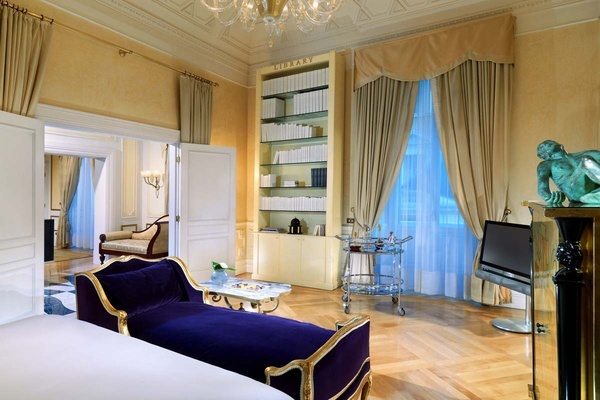 There were three FHR options in Rome: The St. Regis Rome, , and . All best in class, all luxury, and all, I have to add, much bigger than the intimate boutique hotels I usually prefer. I was traveling with my 86-year-old father, who had lived in Rome during its (and his) dolce vita heyday and caroused with many a gorgeous jetset Alitalia stewardess poolside at the Cavalieri. We had stayed at the Cavalieri a few years prior (we were indulging his nostalgia), but I found the location outside the city too inconvenient for walking home at night, one of my favorite travel rituals. Jumeirah could have been an option, but it couldn't compare to the St. Regis, which had history, location, charm, and according to Popupla's girl in Rome, Erica Firpo, the best burger in town. The grand lobby. 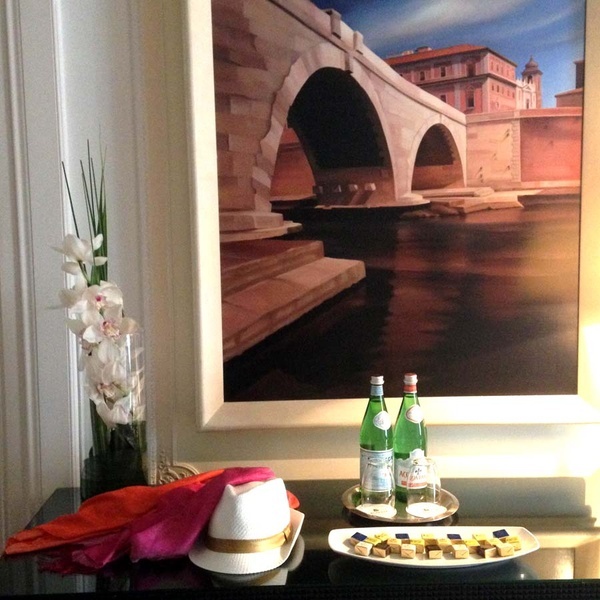 Photos courtesy of the St. Regis Rome. 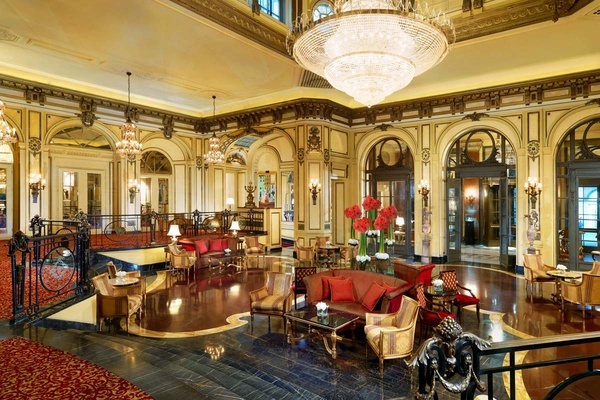 An antique weather vane and the sumptuous lobby. Photos by Pavia Rosati. And what history. 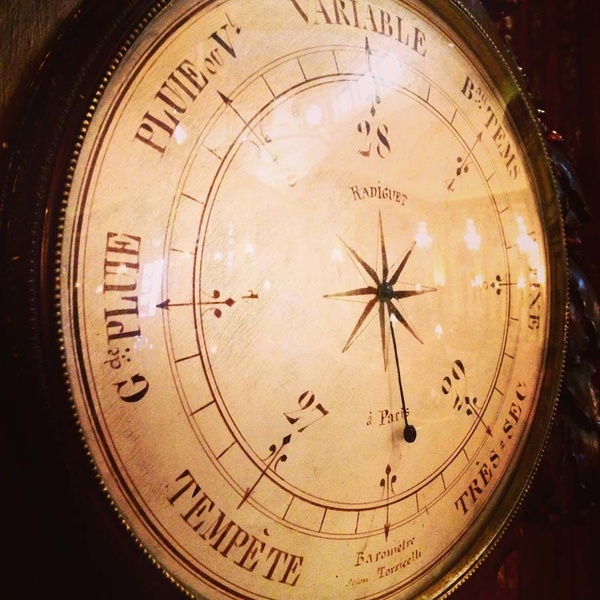 The hotel was opened as the Grand Hotel in 1894 by César Ritz — yes, as in the legendary French hotel. Auguste Escoffier was the first chef — yes, as in the legendary French chef. Italian King Umberto I, Emperor Wilhelm II of Germany, and Pope Leo XIII attended the opening party. A half-century later, Gianni Agnelli was in residence, as was the King of Spain. Richard Burton and Elizabeth Taylor had a soft spot for — and apparently Madonna and George Clooney do too, though I'd rather think about vintage glamour. 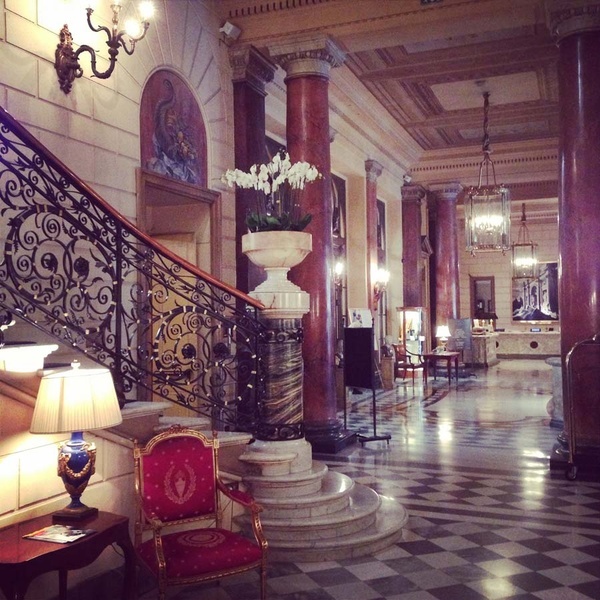 Because, really, I feel like a duchess for the duration of my visit. 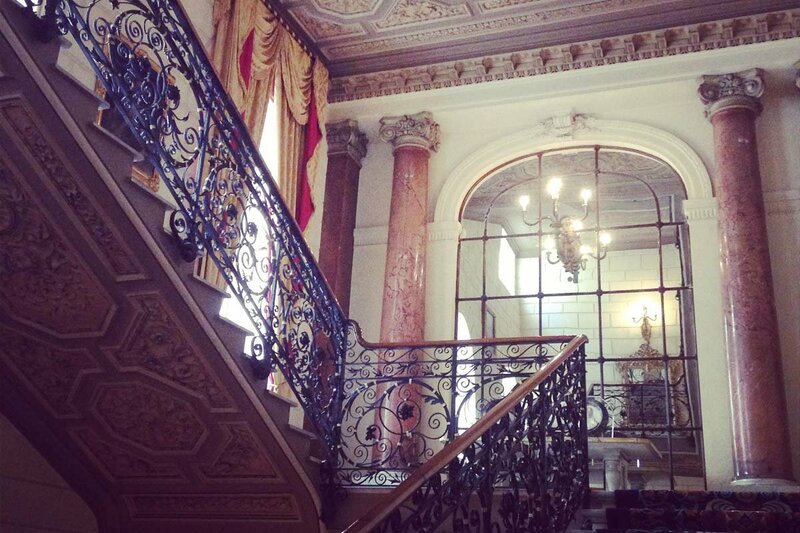 The elaborate staircase leading to my second floor suite was majestic. I couldn't stop photographing it. 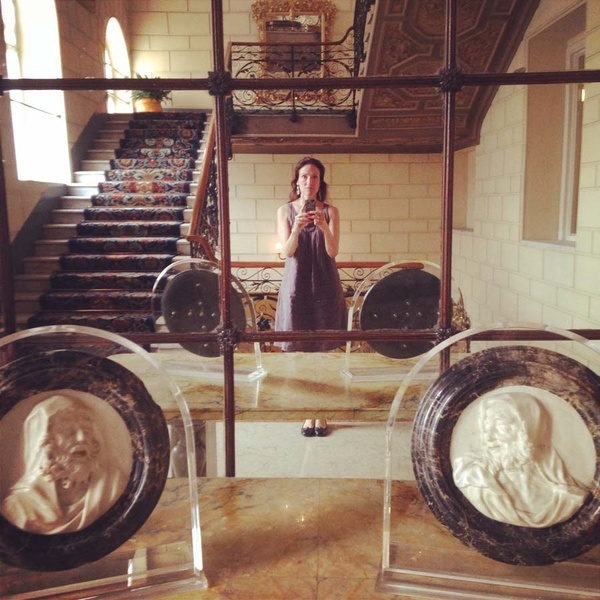 The balcony in my suite was the site of an amusing photo shoot with my father and my Roman aunt Lidia and uncle Sandro, a trio unaccustomed to the art of the selfie but very game to pretend they were visiting monarchs waving to their people on the street below. Not so my friends who came to visit, who stole my artisanal chocolates and posed in the staircase with me. The photogenic stairway. Photos by Pavia Rosati. 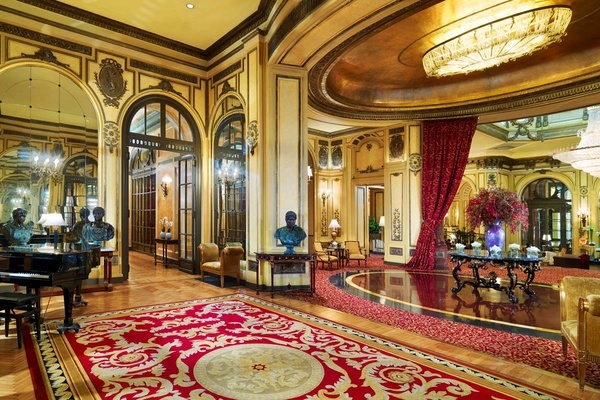 The grand lobby was filled with overstuffed sofas, gilt mirrors, painted ceilings, and interesting antiques. (What I wouldn't have given to be at that opening party.) When I wasn't in my suite, I was stationed throughout the lobby and the adjacent bar, downing Campari sodas with abandon and snacking my way through my $100 Platinum hotel credit. We invited our Roman friend Tonello to join us for lunch at the hotel. The burger is as good as reported. But the measure of a hotel is not just the décor but also the service and the staff, whose attentions can make or break a stay. After an incredible meal in town, we came back with an itch to play poker. It was 2:30 in the morning, and I had forgotten to pack playing cards. 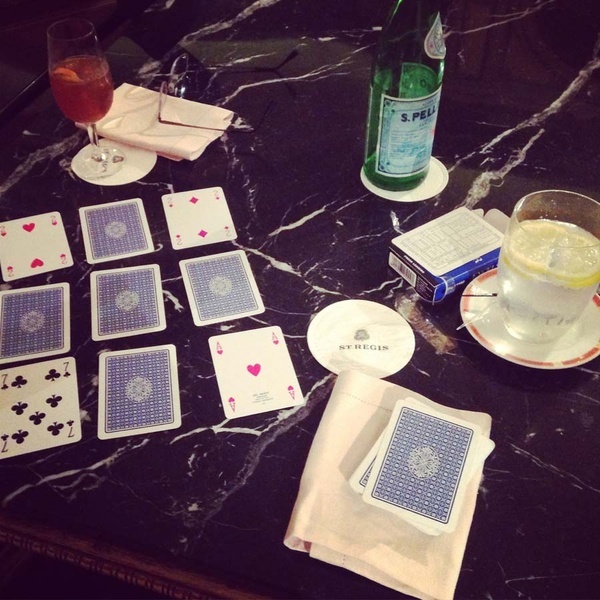 The guys at reception were quick to deliver a fresh deck to our table in the grand lobby along with cocktails for the wee small hours. When I checked out the next day, I saw that the charge for the cards was an astonishing 50 euros. A ridiculous sum, but it didn't matter. I had won 25 straight hands with that deck. This hotel, and everything about my experience, was a winner. All in. Photo by Pavia Rosati. Disclaimer: Pavia Rosati was selected by American Express to help educate consumers about the . As such, she was paid for her services, but all opinions about the experience and American Express are her own.